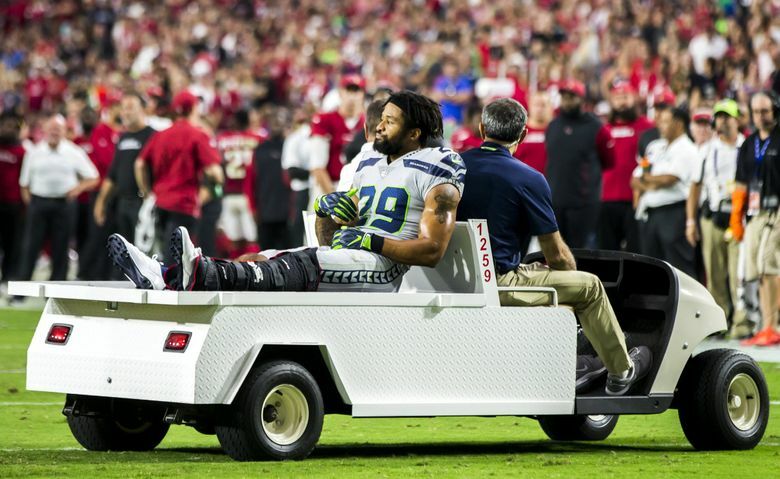 It became official last week that Earl Thomas’ most infamous act in a Seahawks uniform also was his final one — his middle-finger salute to the Seattle bench as he was carted off the field last September at Arizona with what he knew was a broken lower left leg. Thomas had been silent from that night until last week, when he signed a four-year contract worth up to $55 million with the Baltimore Ravens. And maybe it’s always been obvious what was going through his mind when he was carted off the field, given his training camp holdout and obvious desire for a new contract from the Seahawks that he never did get. But his first words explaining it were published Monday in Peter King’s Football Morning In America column, and he made clear exactly for whom the gesture was intended. Indeed, for all Thomas knew, in that moment he had lost millions of dollars because the injury — similar to one he suffered to the same leg in 2016 — potentially could have muted his attractiveness on the free agent market. And in his interview with King, Thomas spoke even more concretely about what his plans were before he got an offer from Baltimore that ended up being in line with the top of the safety market. Thomas told King he was ready to accept — “with regrets,” King writes — a $12 million one-year guaranteed contract with another $1 million in likely-to-be-earned incentives with the Kansas City Chiefs, who were in the process of releasing Eric Berry and apparently before they then signed Tyrann Mathieu to a three-year, $42 million contract. King reports the deal with the Ravens came together in two hours and 10 minutes — and as was noted last week, it was a pretty basic one, with nothing but a $20 million bonus and then base salaries for the next four seasons, Thomas getting $32 million guaranteed in all, all in the next two years. Thomas’ comment further confirms why Baltimore was never mentioned as a contender for Thomas in the run-up to free agency (it’s thought the Seahawks and Thomas never talked). But as King notes, the Thomas saga also shows why even the players and agents themselves never know for sure what will happen once the free agent negotiating period gets underway. Signing with Baltimore means Thomas and Carroll will cross paths again next season as the Ravens are scheduled to play the Seahawks at CenturyLink Field in 2019 — dates of games are not yet set but should be official in April. Carroll, though, long ago shrugged off any offense at Thomas’ actions that night. Thomas was later fined $10,026 by the NFL, the standard fine for a first offense unsportsmanlike conduct violation.